Slogan, Essay writing, Quiz, Painting Competitions, Activities, Celebrations to be conducted on Global Iodine Deficiency Disorders (IDD) Prevention Day 2017 in Schools. 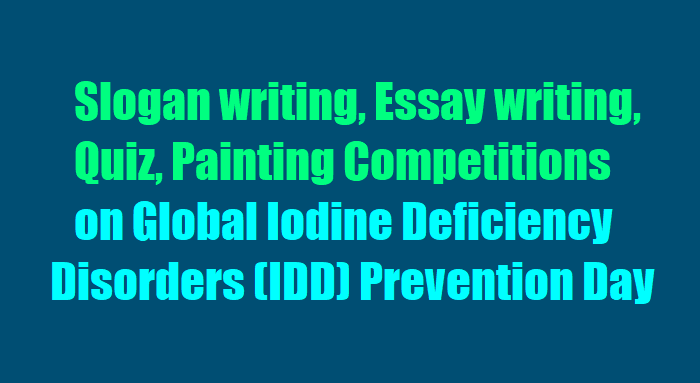 National Iodine Deficiency Disorders Control Programme, Global Iodine Deficiency Disorders Prevention Day Creation of awareness on Iodine Deficiency Disorder - Take Necessary Action. Iodine is an essential mic~f nutrient required daily for normal physical wth and mental developmendl Deficiency of Iodine can cause physical and mental retardation, cretinism, bortions, stillbirth, deaf mutism, squint & various types of Goitre. Some of these Iodine Deficiency Disorders (IDDs) are permanent and irreversible. However, these can be easily prevented before they occur by regular consumptiokvof Iodated Salt. National Iodine Deficiency Disorders Control Programme (NIDDCP) is beinglmplemented in all the States/UTs in order to prevent and control Iodine deficiency disorders. Information Education and Communication activities are extremely important in creating awareness about prevention and control of IDDs. Every year, 21st October is celebrated as "Global Iodine Deficiency Disorders (IDD) Prevention Day" in the country create awareness among the community about IDDs and their prevention. - Inform about importance of consumption of Iodated salt in preventing these disorders. can also be oraganized among the school children. State/UT level p:rogrammes, involving-the Chief Minister/Health Minister couid also- be a·rganized with the issue of appropriate appeals and messages. The Departments of Civil Supplies, Education, Women and Child Development, Panchayati Raj Institutions etc. may be associated in these activities along with voluntary organizations and associations of iodated salt manufacturers/traders of your State/UT.